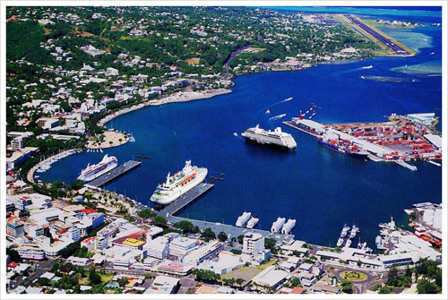 Papeete (pronounced Pah-pay-et-te) is the capital and largest city in French Polynesia. Cruise ships dock at the cruise pier beside downtown. French Polynesian's currency is the Franc (XPF). US dollars and Euros are widely accepted. There are banks and ATM's downtown though banks may not be open on Sunday. Tipping is not expected in Tahiti. Point Venus - This park marks the location where Captain Cook made observations of Venus. There is a lighthouse and a black sand beach here. Paul Gauguin Museum - Dedicated to the life of the famous artist. Only reproductions of his work are shown. Shops and restaurants can be found throughout the downtown area and by the harbour. There is a municipal market close to the cruise pier and a Champion supermarket on the western part of the downtown. Food trucks (Les Roulottes) setup on the pier around 6pm and are open til late. Other recommended places are Les 3 Brasseurs, a French microbrewery near the cruise pier and Jimmy's Restaurant, 31 rue des Ecoles, for Chinese food.